Another year, another Olympics, another Ravellenics challenge. Alas, I did not make it to the “podium” this year for the Ravellenic Winter Games (or “knitting Olympics” as it were). My “event” was the Toy Toboggan with points for stash-down and glory for Team Canada. I had everything planned out: pattern selected and printed, needles, stash yarn at the ready. So what happened? Basically, life happened. I alluded to a sad event in my last blog post that has been hanging over me like a bit of a cloud for the past two months. But then add two more sad personal life events (which I won’t go into detail here), stress, and my chronic pain…and well, the Ravellenics goal of glory went by the wayside. I’ve dubbed this project the “Ravellenics Turd” because honestly, what does it look like to you?! 😉 Its actually supposed to be a Monterey Sea Otter, but so far its just the body and a part of one arm. I’m learning some new skills while knitting this thing, such as shadow wraps, and the eastern cast-on method. I will also have to do embroidery for the sea otter’s face and lots of seaming to put the whole thing together. 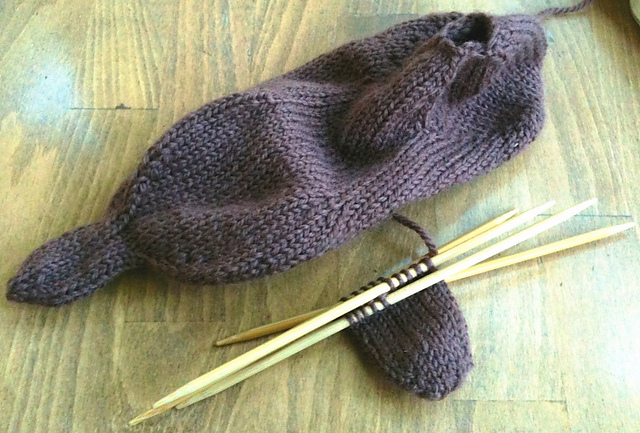 Its one of the things I enjoy most about knitting – learning new skills to make something. Often these new skills feel like magic when I do them for the first time. Other knitters will know what I’m talking about. This project was for a coworker of mine who’s wife is having their first child. Its fitting because I work with aquatic species at risk, and the sea otter (not the Monterey) is one of our species. Nerd humour? You betcha! Because I didn’t finish this project (or in Ravellenics terms, make the podium), and the baby came early (4 weeks too early!) I’m in need of some catching up! My goal is to finish and assemble this toy in the next two weeks or so. Here’s hoping that my back/neck pain will quiet down so I can get some real work done on this fun project. You are currently reading Didn’t quite make it to the Podium at When Gaia Smiles.